When Should I Consider a DIY Photo Booth? Here are the main reasons why people choose to create a Do-It-Yourself photo booth, and some reasons why DIY might not be the best option for you. Cost Effective – If you already have or can borrow the camera, computer and printing equipment necessary, a DIY photo booth can cost less than renting a booth. Highly Customizable – You’ll have full control over every aspect of the quality, design and functionality of the components used. Fewer Features – Unless cost isn’t a factor in choosing to build a booth yourself, it’s likely that your DIY option will be fairly barebones, so options such as Social Media Sharing, Green Screen & Live View may not be available. Time Consuming – The money you’ll save will be in exchange for the time you’ll spend figuring out the details. There are some great articles detailing what others have done, but hiring a photo booth rental company instantly frees you up to focus on the other details of your event. 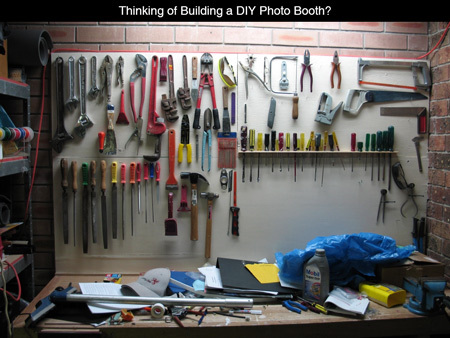 Unprofessional – Your DIY booth may look amateur when compared with other professional photo booths your guests have used. Untested – A professional Photo Booth company will have tested their system prior to your event to know that it will withstand constant use by many users. Printing? – With most DIY booths or Polaroid stations, it’s more difficult to have a copy for yourself as well as copies for guests to keep. Also, if you set up a printer it will likely be a consumer ink jet so you’ll have to deal with the fading and smudging issues.